The LiveFree house is very light and can therefore be placed on land without special foundation provisions. The house is built in a factory and can be moved to the location on a lorry. 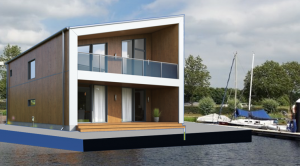 Floating houses can be easily made by placing the house on a floating body. The water experience gives an enormous value as specially in the leisure market.